At a recent event in New Delhi, Nikki Haley, US Ambassador to the United Nations, called Iran “the next North Korea” and urged India to rethink its relationship with the Islamic Republic. This was followed shortly afterwards by an American delegation, led by Assistant Secretary for Terrorist Financing Marshall Billingslea, who came to New Delhi and urged India to cut down on oil trade with Iran. India’s policy towards Iran is facing a crucial test with US withdrawal from the nuclear deal and the expected new sanctions on the Islamic Republic. The visit of the US delegation coincided with regular diplomatic consultations between India and Iran, which included discussion of efforts “to address issues that have arisen” after the US withdrew from the Iran nuclear deal, or, as it is officially known, the Joint Comprehensive Plan of Action (JCPOA). Together, the visits can be seen in the background of impending US sanctions on Iran, set to take effect on 6 August. This has ignited a debate about whether American pressure on India, and India’s continuing efforts to strengthen its relationship with the US, could potentially overshadow New Delhi’s policy towards Iran. It would certainly not be the first time. 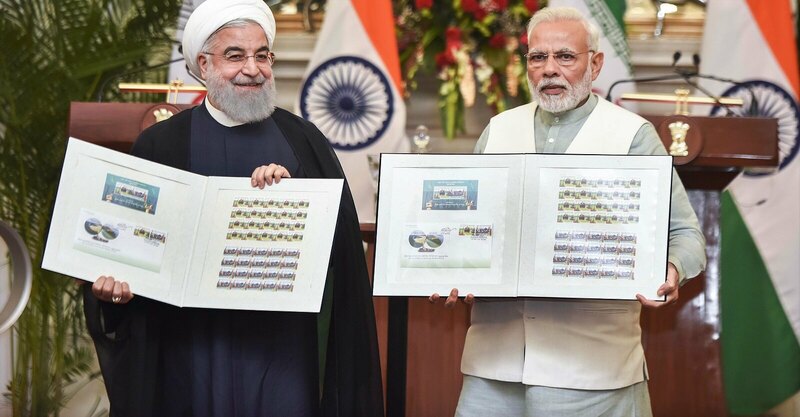 Despite the constant reiteration of civilisational and historical ties, India–Iran relations have had a rocky past, with the two countries often opposed politically, reflecting the need to balance geoeconomic and geopolitical considerations. The debate is bound to get more heated with interjections such as this tweet on Monday from US President Donald Trump. After 2001, India and Iran attempted to establish a strong partnership bolstered by political visits and the New Delhi Declaration signed in 2003 that set out a plan for a more engaged political and economic relationship. However, developments in Iran’s nuclear program and US attempts to censure Tehran under the International Atomic Energy Agency (IAEA) regulations placed a significant constraint on Indian policy. In the midst of negotiating the Indo–US civil nuclear deal, eventually signed off in 2005 by then US president George W. Bush and Indian prime minister Manmohan Singh, there was significant American pressure on India to vote against Iran. In a public statement, then US Ambassador to India David Mulford, observed that “the average American will wonder why the US has gone out of its way to have a nuclear cooperation initiative with India, when India is so friendly to Iran”. Indian interests in seeing the civil nuclear deal through were deemed more important than sustaining the relationship with Iran, and India voted against Iran at the UN Security Council to endorse sanctions. The move significantly damaged the two countries’ relationship, with ramifications felt in the economic and trade sector. Iran cancelled an LNG deal with India, and India in turn decided to discontinue the Asian Clearing Union currency-swap mechanism used to pay Iran for oil purchases. India and Iran did try to salvage trade relations, but owing to sanctions, Indo–Iran trade moved primarily through the United Arab Emirates. Fast forward to 2014, and Indian Prime Minister Narendra Modi’s Look West Policy raised hopes for re-establishing India–Iran ties. This was formalised in 2015 through a trilateral agreement with Afghanistan to develop the Chabahar Port, which would give India access to Afghanistan by circumventing Pakistan and pave the way for robust economic arrangements between the three nations. The agreement was to offer connectivity and trade opportunities to India, and the ability to reach out to Central Asian states to secure India’s energy security and geopolitical position. The lifting of sanctions on Iran with the signing of the nuclear deal in 2015 offered a further boost to a sustainable economic partnership. There were reports that India’s exports amounted to $2.6 billion between April 2015 to February 2016, while imports doubled from the previous year, to $5.6 billion. But India’s policy towards Iran is facing a crucial test once again with US withdrawal from the JCPOA and the expected new sanctions on the Islamic Republic. While the visit by the Iranian delegation to New Delhi featured claims of constructive discussions and the promise of follow-up meetings in Iran at a ministerial level in November, conflicting analysis is emerging on India’s Iran policy. There are reports that India’s oil imports from Iran in June declined by 16% compared to May. On 12 July, Iran’s Chargé d’Affaires Massoud Rezvanian Rahaghi cautioned New Delhi that it will stand to lose “special privileges” if it cuts imports of Iranian oil following US sanctions. A clarification was offered by Iran the very next day, saying it “will do its best to ensure security of oil supply to India, asserting that it has been a reliable energy partner for New Delhi”. However, the exchange indicates tension in the relationship. Iran is sceptical that India will bow to pressure and what is being called an “overt tilt” towards the US. In a very symbolic representation of this, India has invited US President Donald Trump to be chief guest at the Republic Day celebrations in New Delhi in January 2019. More substantive engagements with the US also continue and include the India–US security partnership. In addition, the fragile state of the Indian economy also raises questions regarding its ability to “withstand the US sanctions on those who trade with Iran” under the recently announced Countering America’s Adversaries Through Sanctions Act (CAATSA). Concerns about the Indian economy and political outreach to the US could therefore prove potentially detrimental to relations with Iran, as it did in the past, yet at this moment it is still unclear what approach India will take.